All Vandra Rugs are hand woven. We recommend a pad in felt or similar to ensure that the rug lays still on the floor. This minimizes the wear and prolongs the life of the rug. We recommend that you wash your rug on a regular basis to keep it in good condition. Please see care instructions below, they differ depending on which kind of rug you have chosen. Vandra Rugs Cotton – are woven with cotton rags on linen yarn. In the beginning, the cotton rags may shed threads. This is part of the rag rug look and character and will stop after a times use. If it disturbs you, the threads may be cut off. 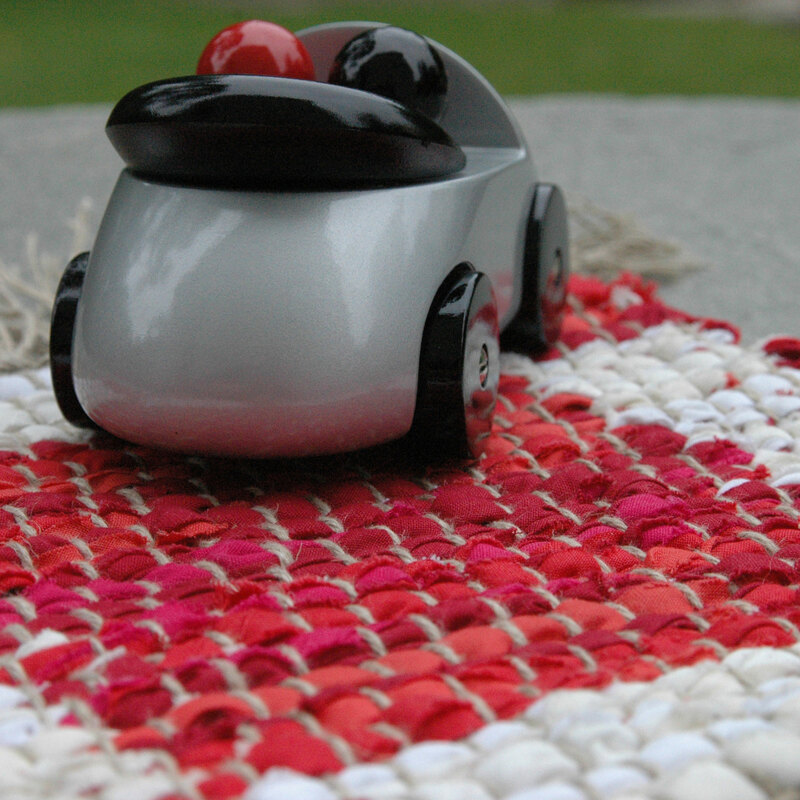 The rug is woven from rags of coloured cotton, they may fade, especially if the rug is placed in direct sunlight. We recommend that you rotate and turn the rug over in order for it to fade evenly. We recommend water wash of the rug. The rug should be washed flat and be throughly rinsed and thereafter hung to dry and finally rolled to retain its shape. Small stains can be carefully wiped away with a slightly damp cloth. Vandra Rugs Wool – are woven with wool felt rags on linen yarn. They have a colour fastness of 5 according to UNI EN ISO 105 B02. The rug may fade, especially if it is placed in direct sunlight. We recommend that you rotate and turn the rug over in order for it to fade evenly. We recommend dry cleaning if not too heavily dirty and if stains are oil or chemical. If the rug is heavily dirty, or stained with wine or blood, water wash is recommended. Vandra Rugs Carpathian – are woven with hand-spun, non-dyed wool yarn on linen yarn. The colour may vary depending on the sheeps natural colours. We recommend dry cleaning. Small stains can be carefully wiped away with a slightly damp cloth We recommend dry cleaning if not too heavily dirty and if stains are oil or chemical. If the rug is heavily dirty, or stained with wine or blood, water wash is recommended. Whatever type of stain you have on your rug, it is important to fix the damage as soon as possible. Here are some tips of how to remove different types of stains. The first thing to do is for stains such as food, scraps, sauces, feces and vomit to remove as much as possible with a spoon or similar. In case of liquids such as wine, coffee, milk , body fluids try to soak up as much as possible with a towel or paper-napkin from the top side as well as from the bottom. DO NOT RUB! Secondly mix a water solution: 1 liter of lukewarm water with 1 tablespoon of mild detergent such as shampoos, laudry soap or gall soap. Moisten a white cloth with the solution and dab it onto the effected area. DO NOT RUB! If you see the slightest hint that the rugs colour has dropped or rubbed off you you should talke a dry cloth and dab dry and call a proffesional rug cleaner. Otherwise continue dabbing the affected area with washing solution . Be careful not to spread the ”stain”. Make use of a sponge, cloth, swab or like. Only dab on the affected area. The finish off by dabbing dry. NEVER RUB! Then mix a rinse solution of: 1 liter of cold water, 1 teaspoon of hair conditioner or softener for washing machines, 1 teaspoon of food acetic acid (may be omitted if not available). Saturate a cloth, swap, sponge or similar with fabric softner solution and dab alternating with dry cloths, such as towel or sheet. Repeat 3-5 times. DO NOT RUB! Finish by dabbing with a dry cloth or paper towel. It is important to continue drying until sheet or paper towel stops absorbing. Final finish: Carefully use your hairdryer set at the lowest heat. Let in air to circulate by adding something between the rug and the floor during the first 24 hours. This will also protect the floor. Note that the rug may feel dry on top but still be moist inside/ underneth. Once you have followed the above instructions you have hopefully gotten rid of the stain. Not to worry if the stain is still there as you have greatly improved the situation for a great result if you then opt to send the rug to a proffesional rug cleaner.